Guaranteed to be one of the best nights of your holiday, this 12 hour long bar crawl starts at the tropical themed Tiki Bar at 8:30 before taking you around 6 of Ayia Napa's best bars. This is followed by free entrance to one of Ayia Napa's top clubs and free entrance to Aqua after party! Throughout the night the team of crazy reps will keep you in the party spirit by giving away up to 20 bottles of free sambuca and tequila in each and every bar.There are plenty of party games for all to get involved in, of course all involving more free alcohol! You also receive a free T-shirt and wristband to wear on the night. This will entitle you to cheaper drinks in all of the bars and clubs you visit and also acts as your free entry pass into the clubs included. During the whole night you are followed around by a team of professional videographers and photographers who upload all the nights pictures onto social media platforms for you to share with your friends and family! 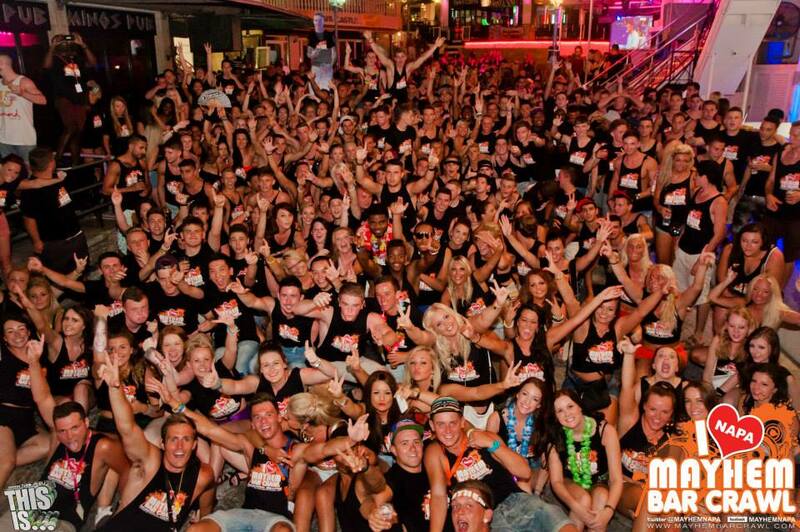 Who doesn't want to remember a night of your holiday on Mayhem barcrawl! Beer bongs and party games. Best night of your holiday.......FACT!! Terms and Conditions: Love Ayia Napa is not liable or responsible in any way whatsoever for cancellations, accidents, incidents or any other issue relating to any events, activities or excursions in or departing from Ayia Napa. Love Ayia Napa acts as an agent only and is not responsible for the running of, promotion of, or ticket issue of any tours or excursions. Deposits are non refundable unless the tour/event/activity does not operate. Participants are responsible for their own actions during the tour/event/activity and must follow the safety instructions and advice given by the guide/leader/driver of the tour/activity/event or captain/crew of the boat.